When large flooring projects become large flooring problems, contacting Floor Covering Services & Consultants is likely the best way to figure out the root cause of the flooring failure and put steps in place the resolve the problem associated with the installed floor covering. Figuring out what really caused a major problem with a resilient floor installation can be complex and it takes an expert in the field of flooring to find the underlying reasons for the flooring dispute. Reggie Hill, owner of FloorConsult and 1877FloorGuy, is the right person to contact for the most difficult flooring issues. With over 30 years of experience working with resilient flooring, Reggie has a critical eye for detail, a strong base of knowledge about floor installation procedures, is familiar with flooring installation tools, adhesives and techniques. These combined skills give him a unique ability to figure out what’s going on with even the most difficult commercial flooring projects. In addition to troubleshooting floor issues in the field, Floor Covering Services & Consultants provides a number of flooring related services including telephone technical support for flooring brands, expert witness testimony for attorney litigation cases involving resilient flooring installation, resilient floor testing for adhesives compatibility, floor finish performance testing for scratch resistance, flooring installer training for heat welding and other resilient floor install skills, floor cleaning and maintenance training for facilities maintenance groups, floor care product and floor machine equipment recommendations and sales. As the in-house, hard surface flooring expert at FloorConsult, Reggie Hill leads the consulting services division with the support of a highly capable, trained staff. Reggie and his team focus consulting services on the commercial flooring market, before, during or after a new floor is installed, specializing in work with sheet vinyl, VCT, LVT, rubber, linoleum and cork as well as other flooring materials that fall into the resilient floors category. 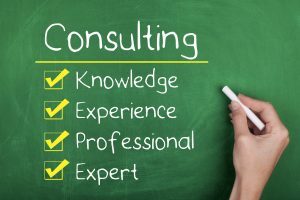 Whether you are an architect or interior designer working on a flooring specification for a building project, a business owner with questions about a new floor, a construction project manager in the middle of a large commercial floor installation, a flooring manufacturer looking to extend resources, or an attorney looking for a resilient flooring expert witness, Floor Covering Services & Consultants may be able to help. To find out, give Reggie Hill a call or send an email to ask about your specific flooring situation. Reggie is honest and forthright about his ability to help so you’ll find out quickly if you’ve come to the right flooring resource. Often, the solution to a flooring problem is simple. For example, an LVT floor that seems too easily scuffed and scratched may simply need felt protective furniture pads fitted onto chairs and tables or a dingy linoleum floor may just require a change in floor maintenance procedures from a single mopping bucket that repeatedly puts dirty water back onto the floor to a two-bucket floor cleaning system with a quick change mop for fresh clean equipment that will result in a bright, clean floor. To gain more insight into Reggie Hill’s high level of expertise, read articles in his blog, Reggie’s Floor Stories™. A few blog posts that contain practical flooring information are Success with Spray, Tape and Back Rolled Adhesives, Eliminate Flooring Complaints – READ INSTALLATION INSTRUCTIONS and True or False: Tile Run Off Means Floor Tiles Not Square.